Mississippi is probably most famous in the rest of the United States for the spelling of its long, tongue-twister name. 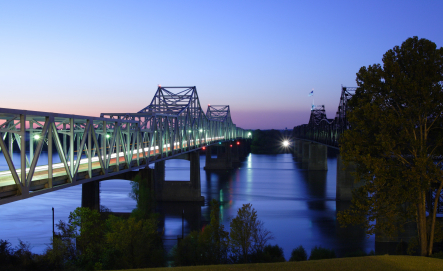 It is located at the southern end of the Mississippi River where it dumps into the Gulf Coast. Mississippi is a great place for people who don't like winter weather. The state enjoys extremely mild temperatures during the winter and long, hot summers with high humidity. Car insurance isn't cheap in Mississippi, so it's a good idea to learn more about your car insurance options in the state. You'll need to understand the basic insurance requirements. If you're moving to Mississippi, you'll also need to understand the laws regarding licensing and registration transfers. In many cases, you'll need insurance first. Do yourself a favor and compare online insurance quotes to be sure you get the best deal. Even if you're already a resident, checking rates at least once every year, preferably every six months, will save you a bundle. Optional UM coverage can be no less than the required bodily injury liability coverage. UM coverage cannot be more than the bodily injury liability coverage owned. If you would like to learn how much you could be paying for car insurance in Mississippi, enter your zip code in the form on this page for more information. A new resident must transfer their vehicle registration and driver's license within 30 days of moving to Mississippi. Failing to register on time can lead to expensive fines based on how late the registration is. If you are an active member of the military or a student attending college from out of state, you do not have to transfer your license or registration because you qualify as a temporary resident. Registration and license transfers fall under the jurisdiction of the Mississippi Department of Revenue. Where you register your vehicle in Mississippi depends on the weight of the vehicle and whether you plan to drive it across state lines regularly. The most common registration type is for a vehicle that weighs less than 10,000 pounds that usually stays within the state lines. These registrations are done at you nearest local county tax collector's office. The tax collector's office also handles registration transfers for vehicles that weigh more than 10,000 pounds and will stay within the state. If you have a vehicle that weighs more than 10,000 pounds that will drive across state lines on a regular basis, you must go to Clinton, at the Department of Revenue office. You will be charged a 5% fee if you register your vehicle within 15 days after the due date. If you register between 15 and 30 days after the due date, you will pay an additional 5% fee for every 30-day period that lapses after the due date. The maximum allowable penalty is 25%. If you would have qualified for a Legislative Tag Credit, you will lose your qualification if your late registration fee reaches the 25% penalty level. New residents who fail to register within 30 days of moving to the state will pay the standard late fees as well as a flat $250 fee. Regardless of the date you transfer your registration, you will not qualify for the Legislative Tag Credit if you did not have proper tags in your former state. Mississippi requires that each vehicle registration transfer include specific original documentation. You will need to provide the title from the state in which the vehicle was formerly registered. You will also need to provide an official odometer disclosure statement for the vehicle. If you do not have an out of state title for the vehicle, you will need to present the manufacturer's statement of origin proving that you are the legal owner of the vehicle. Identification documents such as a social security card or driver's license with your current Mississippi address will be required as well. You can use a utility bill, paycheck stub, or other official document with your legal name and address to prove that you are a current Mississippi resident. When you transfer your registration from another state to Mississippi, you will be required to pay a standard 5% sales tax on your vehicle. The Department of Revenue will not apply taxes that you may have paid in your previous toward your Mississippi taxes. The 5% tax rate is based on the latest value of your vehicle as listed in the most current assessment schedule available. If you bought the vehicle within the last year, your tax rate will be based on the dealer's price before any applicable rebates. New residents can apply for a Mississippi driver's license at any local driver's license office. You must transfer your license within 30 days of becoming a Mississippi resident unless you are a part-time resident as outlined above. Driver's license centers are located throughout Mississippi, and you do not have to visit an office within your home district in order to transfer your license successfully. Once you have transferred your license, you can utilize the online license renewal system to renew your license when it expires the next time. The initial license transfer must be done in person at a driver's license office. When you apply for a license transfer, you must give the driver's license office your out of state license. You will also need to provide proof that you are in the United States legally through a social security card, naturalization papers, or any other official documentation of your presence in the country. You can prove that you are a Mississippi resident by presenting an original document that came from an external source and lists your name and your Mississippi address. A paycheck, mortgage agreement, school paperwork, or any other similar documentation is acceptable to the licensing office as proof of residency. Drivers under the age of 17 have special restrictions and requirements they must meet before they can earn a Mississippi driver's license. You must present a school attendance form that proves that you have attended at least the minimum legally required sessions of school within the last school year. You must fill out a separate license application and pass a written driving exam in order to qualify for your Mississippi license. Licenses for drivers under the age of 17 expire within two years of their issue date. Once you turn 18, you can qualify for a standard license. In most cases, you will not need to take any tests in order to transfer your out of state license to a Mississippi license. The clerk at the driver's license office has the authority to request any type of test they feel is necessary at any time, however. Drivers under the age of 17 will be required to pass a written exam before they can receive a Mississippi license, even if they already hold a valid license from another state. If your license has expired, your likelihood of being required to pass at least a written test will increase.